Can Am XMR Review, Specs, Photos, and Video. Can Am XMR - Outlander for the Mud. The Can Am XMR, based on the long wheelbase Outlander Max, represents Can Am's splash into the world of mud ATVs. A development partnership with Gorilla Axles, an integrated snorkel system, relocated radiator, and the V-twin Rotax 800R engine tells you that they're not just playing around. The Can Am Outlander 800R XMR takes direct aim at the Arctic Cat Mud Pro as the only other factory mud ready ATV. 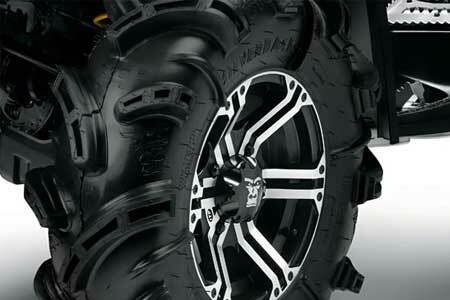 The Mud Pro goes old school with a big 1000 V-twin engine and a series of beefed up parts for its' mud bog assault. Can Am uses a more sophisticated high tech approach. That's what the next section is about. The Can Am Outlander XMR comes with high mounted radiator and Gorilla tires. Can Am XMR - Features That We Care About. The 800 Rotax V-twin pounds the ground with 71 hp thanks to electric fuel injection, SOHC 4 valve heads, and liquid cooling. 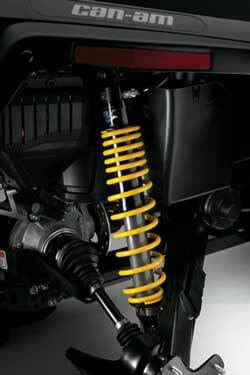 The Can Am XMR goes high-tech with 6 position air shocks at both front and rear. An onboard compressor and push button controls allow you to pick any one of the 6 ride height settings. There is a lockout feature that prevents you from going any higher than the number 2 position at speeds over 35 mph. The Outlander XMR also comes with an air hose and chuck for airing up your tires. Many riders like to lower their air pressure when mud riding. This feature lets you refill the tires for trail riding or getting to the next mud hole. 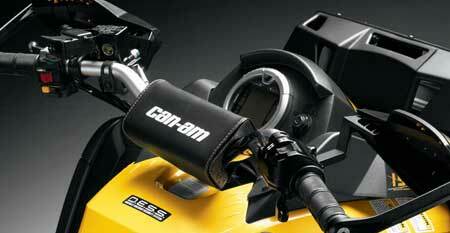 For 2012, the XMR gets the three position power steering unit common to other Can Am ATVs. The previous models came with a two position. The new unit just gives you more options for adjusting the steering feel to suit more situations. We think this is a must have feature on a machine with this much power and weight, and the fact that it will be ridden in 4 wheel drive the majority of the time. It really makes the Can Am XMR much more usable for more types of riders. You don't have to hit the gym every day to be able to ride this mud ATV. On the XMR, Can Am chose to go with an invisible snorkel hidden at the highest point of the ATV, just underneath the handlebars. You may give up a little in ultimate submarine capability, but you don't have a big honkin' snorkel tower to get in the way, or that you can't see around. The radiator is relocated to the area normally occupied by the front rack on an Outlander. If you are serious about mud riding your ATV, this is a mod you would have had to do. The factory just gave you one less thing to worry about with this slick installation which preserves at least a little rack space on either side of the radiator. High radiator mount keeps it out of the mud and water for cooler running. Heavy duty axles by Gorilla, 14 inch ITP aluminum wheels, and Gorilla Silverback ATV mud tires complete the driveline package. You even get a little Gorilla emblem in the wheel centers as a reminder. Gorilla Axle supplies the Silverback tires and wheel center caps. Wheels are ITP. A 3,000 pound Warn winch is standard on the Can Am XMR. You'll also get a roller fairlead, a wired remote control, and a special storage area for the controller. 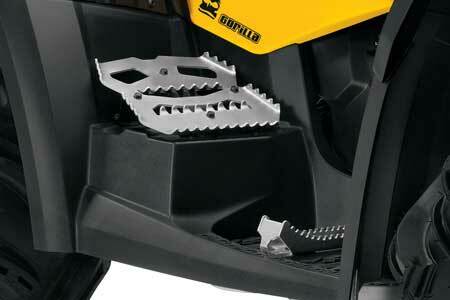 Custom foot pegs designed just for ATV mudding, complete with deep serrations for better traction. Special body work with extended mud splash guards. Hand protectors on tapered aluminum handlebars. Tapered aluminum handlebars complete with hand protectors. Special graphics and seat cover. The XMR gets special rear mounted foot pegs for better balance and traction in the mud. For those of us that do better with visual aids, here's a video complete with girls and an announcer with an Aussie accent. The things we do for you guys! 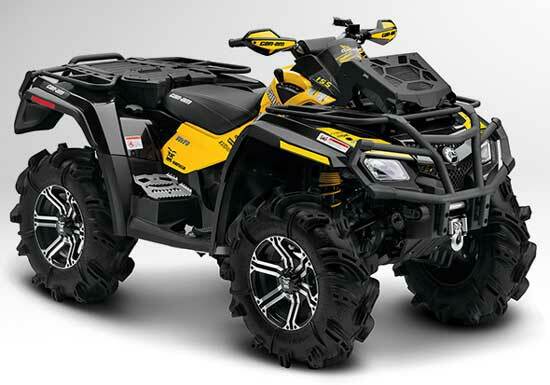 Can Am XMR Outlander specifications. Can Am XMR - Problem Areas. The "heavy duty" axles that came on the first batch of Can Am XMRs didn't quite get the job done. There have been a few updates with the axles getting progressively "heavier duty". The problem seems to be under control with the latest versions. As long as you don't do crazy stuff. Early models had some issues with the electric power steering. It seems that the spark plug wire was routed too close to some wiring that went to the power steering unit. This would occasionally cause the unit to become "confused" and shut down. This problem seems to have been solved on later models. Some owners had problems with water getting by the seals in the differentials. These appear to be rare but it is something to be aware of and keep an eye on. It will cause catastrophic and expensive failure of the diff! Can Am Outlander XMR - the hi-tech solution to ATV mudding. 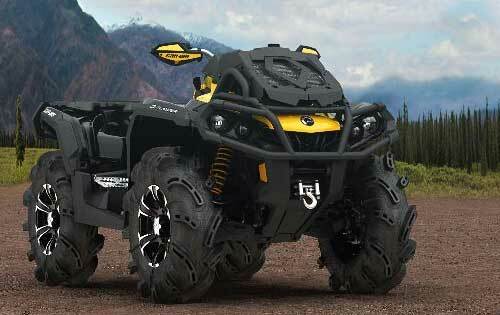 As of 2012, the Can Am Outlander XMR represents the ultimate ATV for mud riding. It throws a lot of modern, sophisticated technology at the age old problem of how to get through a mud hole. You pay a price for all this, but you do get some unexpected benefits. Unlike some other specialized ATVs, the XMR is actually pretty versatile. Need to do some work? The 1,300 pound towing capacity and strong engine are great for pulling. Those big Silverback tires also get a pretty good bite in snow and ice, great for running that snow plow. The adjustable suspension adapts to a load on the racks with the push of a button if you need to carry a load. This Can Am XMR isn't bad for trail riding either. Not really the big wide open sort of thing, but the tight and knarly stuff that would give other ATVs problems. We love the adjustable air suspension for finding the ideal setting for any trail situation. And you never have to get off the ATV to do it! It's also nice to be able to adjust the air pressure in the tires with the onboard compressor. No doubt, the big tires give a rough ride, but in slower type trail riding it's really not a problem, and the power steering helps to dampen the roughness. The one thing that may be unpleasant is the heat from the high mounted radiator in hot weather riding. There is a fair amount of hot air that gets blown back on the rider in trail riding. If you're going through mud and water, you won't notice it, and in cooler weather it will probably be welcome. So the Can Am XMR is expensive at something over $13,000. But to modify a different model for equivalent ATV mudding competence, you would spend as much or more, and have no factory warranty. Nor would you have the versatility of the XMR. I'll stop now, before I talk myself into buying one of these things! Can Am recently announced the XMR for 2013 will be equipped with the 1000 engine, and will be based on the all new Outlander Max 1000. 2012 will be the last year for the 800R engine. Can Am ATV Outlander - Guide to all Outlander models. 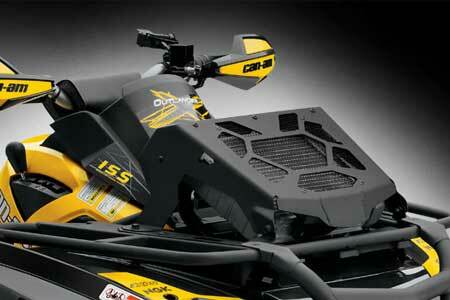 Can Am Outlander 1000 - Review with photos and specs. 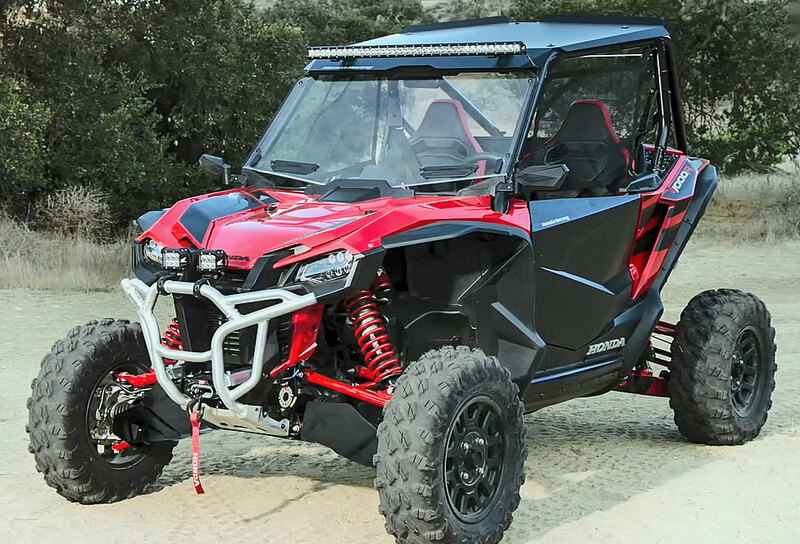 Can Am Renegade 1000 - Full review of the big 4wd sport ATV. ATV Mudding - Tips and tricks for ATV mud riding.